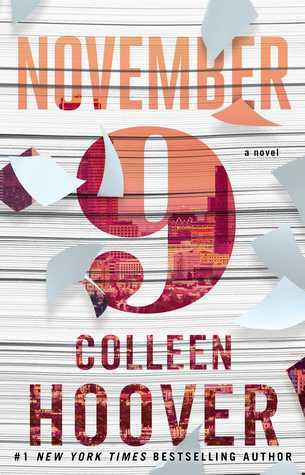 Summary: Beloved #1 New York Times bestselling author Colleen Hoover returns with an unforgettable love story between a writer and his unexpected muse. When I started this book, I wasn't expecting to love it as much as I did. I don't really know why I thought I wasn't going to enjoy it, I just got this feeling. But after I was done with the first part, I was hooked. November 9 follows the love story between Ben and Fallon. Right as Fallon is ready to move to New York, she meets Ben the Writer and they're immediately attracted to each other. They spend Fallon's last day in LA together, promising to meet every year on the same day. Ben is able to use this as inspiration for his novel. Over the next few years, they're attraction grows stronger, but Ben is hiding one major secret that can jeopardize everything they've been through together. This book was simply adorable. The immediate attraction between Ben and Fallon was truly the story book love Fallon hoped for. Ben is able to make Fallon feel more confident in the few hours they spent together that first November 9th, than she has felt in those two years since the fire that almost took her life. For one person to give someone that much confidence, is something I think every girl hopes for in a boy. I loved that every year they were able to pick up right where they started, as if a whole year hasn't gone by with absolutely no communication between the two. I give them props for being able to go an entire year without any communication (I totally wouldn't be able to do that). As for Ben and his giant secret (I'll wont spoil it, I promise), I feel Fallon acted appropriately but should have let him explain sooner! Poor Ben has been through just as much heart ache as Fallon. Now, I'll let you read the book to find out if they get their happily ever after. This book left me wanting so much more after I was finished. It kept me turing every page wondering what plot twist was coming next. Like I said before, Colleen Hoover has done it yet again. I'm so glad you liked this one! 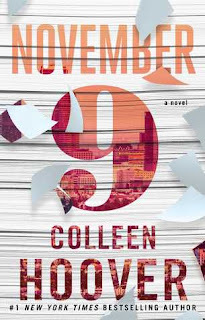 I have yet to read a book by Colleen Hoover, but I definitely want to check this one out.